This article describes RESTflow™, a new method for exporting flow records that has significant advantages over current approaches to flow export. A flow record summarizes a set of packets that share common attributes - for example, a typical flow record includes ingress interface, source IP address, destination IP address, IP protocol, source TCP/UDP port, destination TCP/UDP port, IP ToS, start time, end time, packet count and byte count. Figure 1 shows the steps performed by the switch in order to construct flow records. First the stream of packets is likely to be sampled (particularly in high-speed switches). Next, the sampled packet header is decoded to extract key fields. A hash function is computed over the keys in order to look up the flow record in the flow cache. If an existing record is found, its values are updated, otherwise a record is created for the new flow. Records are flushed from the cache based on protocol information (e.g. if a FIN flag is seen in a TCP packet), a timeout, inactivity, or when the cache is full. The flushed records are finally sent to the traffic analysis application using one of the many formats that switches use to export flow records (e.g. NetFlow, IPFIX, J-Flow, NetStream, etc.). Figure 2 shows the relationship between the widely supported sFlow standard for packet export and flow export. With sFlow monitoring, the decode, hash, flow cache and flush functionality are no longer implemented on the switch. Instead, sampled packet headers are immediately sent to the traffic analysis application which decodes the packets and analyzes the data. In typical deployments, large numbers of switches stream sFlow data to a central sFlow analyzer. In addition, sFlow provides a polling function; switches periodically send standard interface counters to the traffic analysis applications, eliminating the need for SNMP polling, see Link utilization. There are significant advantages to moving the flow cache to external software: the article, Superlinear, discusses some of the scaleability implications of on device flow caches and, Rapidly detecting large flows, sFlow vs. NetFlow/IPFIX, describes how on device flow caches delay measurements and makes them less useful for software defined networking (SDN) applications. The following example uses the sFlow-RT analyzer to demonstrate flow record export based on sFlow packet data received from a network of switches. Figure 3 from Performance aware software defined networking shows how sFlow-RT exposes the active flow cache to applications that address important use cases, such as DDoS mitigation, large flow load balancing, multi-tenant performance isolation, traffic engineering, and packet capture. The recent extension of the REST API to support flow record export provides a useful log of network activity that can be incorporated in security, information and event management (SIEM) tools. The JSON encoded text based output is easy to read and widely supported by programming tools. Transporting large amounts of flow data using a text based protocol might seem inefficient when compared to binary flow record export protocols such as IPFIX, NetFlow etc. However, one of the advantages of a REST API is that it builds on the mature and extensive capabilities built into the HTTP protocol stack. For example, most HTTP clients are capable of handling compression and will set the HTTP Accept-Encoding header to indicate that they are willing to accept compressed data. The sFlow-RT web server responds by compressing the data before sending it, resulting in a 20 times reduction in data volume. Similarly, using a REST API, allows users to leverage the existing infrastructure to load balance, encrypt, authenticate, cache and proxy requests. Instead of simply printing the flow records, the script could easily add them to scale out databases like MongoDB so that they can be combined with other types of information and easily searched. 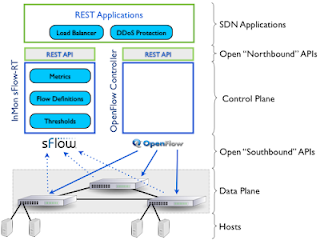 The sFlow-RT REST API doesn't just provide access to completed flows, access to real-time information on in progress flows is available by querying the central flow cache. For example, the following command searches the flow cache and reports the most active flow in the network (based on current data transfer rate, i.e. bits/second). As well as identifying the most active flow, the query result also identifies the switch and port carrying the traffic (out of potentially tens of thousands of ports being monitored). While flow records are a useful log of completed flows, the ability to track flows in real time transforms traffic monitoring from a reporting tool to a powerful driver for active control, unlocking the capabilities of software defined networking to dynamically adapt the network to changing demand. Embedded flow caches in networking devices are not easily accessible and even if there were a programmatic way to access the on device cache, polling thousands of devices would take so long that the information would be stale by the time it was retrieved. Looking at the big picture, flow export is only one of many functions that can be performed by an sFlow analyzer, some of which have been described on this blog. Providing simple, programmatic, access allows these functions to be integrated into the broader orchestration system. REST APIs are the obvious choice since they are already widely used in data center orchestration and monitoring tools. Embedded flow monitoring solutions typically require CLI access to the network devices to define flow caches and direct flow record export. Access to switch configurations is tightly controlled by the network management team and configuration changes are often limited to maintenance windows. In part this conservatism results because hardware resource limitations on the devices need to be carefully managed - for example, a misconfigured flow cache can destabilize the performance of the switch. In contrast, the central sFlow analyzer is software running on a server with relatively abundant resources that can safely support large numbers of requests without any risk of destabilizing the network. The REST APIs in sFlow-RT are part of a broader movement to break out of the networking silo and integrate management of network resources with the orchestration tools used to automatically manage compute, storage and application resources. Automation transforms the network from a fragile static resource into a robust and flexible resource that can be adapted to support the changing demands of the applications it supports. I have done all these things which you have mentioned in this document. I am not getting any tcp flow datails. My sflowrt and sflow agent are on same machine. Have you enabled packet sampling on your sFlow agent? I see the flows dumped by the application, is there a way to get Vlan associated with these flows ? Check the /flowkeys/html page to see the tokens available to define flows. I have a Machine Learning algorithm and I would like to take the flow statistics as an input to my Algorithm. Do you have an idea on how I can do that? What type of input do you need for your algorithm? This article shows how to stream flow records to a Python program. Streaming events is similar. Your program could also poll sFlow-RT's REST API for metrics.